Last October, Andy Lyon limped into the emergency room at Yakima Memorial Hospital, in central Washington State, looking a bit worse for wear. If you were the type to jump to conclusions, the beard, lean face and dirty clothes would probably lead you to believe that Andy was a homeless person. In a way, he was. The ER took him in and started asking the normal questions. They didn’t get the normal answers. They asked him how he had gotten to the hospital. He said he walked—from Mexico. (Truthfully, he caught a ride for the last couple of miles to the hospital, but since he had walked the proceeding 2,289 miles, that wasn’t much of an exaggeration.) They asked if he had any pre-existing conditions they should know about. He said, yes, he had survived two battles with Hodgkin’s lymphoma, a kind of cancer of the blood. But that’s not why he walked into the hospital. His problem was a shooting pain that went from his hip all the way down his leg. He hadn’t come to the hospital for another encounter with modern medicine. It wasn’t that he had lost confidence in the latest treatments, but he had taken a different approach the last couple of years. Right now he just wanted to walk in, get this fixed, and walk back out. Andy was born in Southern California in 1988. He was bright, creative and, above all, as his mom puts it, “…interested in the world around him.” His life wasn’t idyllic—he lost his father at age sixteen—but when he graduated from high school he had a number of scholarship offers and the ability to pick from a list of terrific schools. He chose the University of California at Berkeley. Halfway through his first year he was diagnosed, for the first time, with Hodgkin’s lymphoma. The survival rate for this type of cancer is good. More than 80% of those diagnosed are cancer-free five years later. The treatment was unpleasant and took months, but within a year he had returned to Berkeley with a relatively clean bill of health. Then the cancer came back. After the second occurrence his doctors were convinced that they needed get more aggressive. That meant a more intensive course of chemotherapy, a stem cell transplant, and more than three weeks in a hospital-imposed sterile environment. Once again, Andy and his supporting team beat back the disease. During a routine follow-up about three months later, a tumor was discovered near the bottom of his spine. The cancer had returned again. This time Andy decided on a different approach. He had become convinced that changes to his lifestyle and diet could have an impact on his lymphoma, so that’s the direction he went. On April 7th he took his first northbound steps. Within a month he had covered more than 300 miles. At the end of August he hiked out of California, having walked through the entire state, lengthwise. It took him less than a month to push through Oregon. In early October, however, there was trouble. He was experiencing hip and leg pain and it was getting to be too much. That’s how he found himself in Yakima, surrounded by doctors and nurses who weren’t quite sure what sort of patient had stumbled into their hospital. It turned out, however, that the same aggressive medical intervention that Andy had rejected earlier would save the day. His leg pain was caused by another reoccurrence of the cancer, again from a tumor pressing against his spine. A little over a year ago, the FDA approved a new drug for the treatment of those kinds of tumors: brentuximab vedotin. The drug doesn’t always work, but often, when it does, it works very quickly. It worked on Andy; less than a week after he first left the trail he was back on it. There were still nearly 400 miles of trail to walk, and the fall weather was deteriorating into rain and cold. 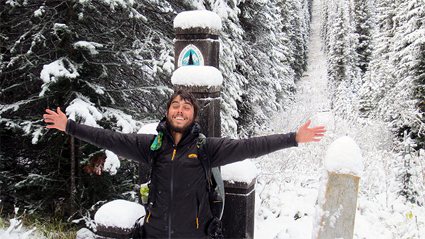 Any PCT thru-hiker races the calendar to get to the Canadian border before the snow begins. Those challenges, however, proved no more insurmountable than the others Andy had already overcome. At 4:30 p.m. on Friday, October 19th, Andy finished the PCT. A blog, mostly written by his mother, can be found here. It’s full of gratitude for the many people who helped Andy succeed—and rightfully so. But, of course, only one person actually walked the walk. Since his return from the trail he has re-engaged with an oncologist and is getting additional infusions of the vedotin. His story has been told by a number of media outlets and he has a ton of people pulling for him. Well done, Andy, and good luck. Andy at the US/Canadian boarder. Used with permission. What a touching, amazing story. Thanks for posting this and bringing his story to your readers. Inspiring story. Hopefully he completes the Triple Crown! Now, that would be something. Thanks for the comment!